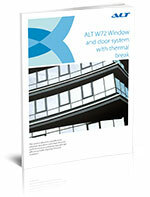 The ALT W72 system is used to manufacture windows, doors and entrances designed for modern energy efficient and passive buildings. Due to newest technologies and materials, modern engineering methods the ALT W72 system meets the highest requirements. Air permeability: Class 3 (positive), Class 2 (negative). Interior opening windows (casement, tilt & turn, hopper). Integrated into a curtain wall windows. Integrated into a curtain wall doors. Doors with high basement profile. In addition, high strength and easy maintenance increase significantly the operating period of doors and windows made of aluminium profiles. High thermal parameters of the profiles are comparable with best wooden frames. High level of sound insulation. 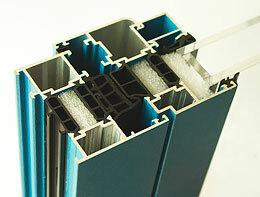 Wide range of profiles and technical solutions. Simple and faults excluding assembly technologies. Profiles are made of AlMg0.7Si EN AW-6060 T6 alloy, which is resistant to corrosion and allows manufacturing high precision profiles. Combined profiles are made with the use of thermal insulating glass-filled polyamide profiles produced by leading European suppliers. Great strength characteristics of combined profiles are ensured by modern technology of joining different materials. EPDM-based rubber gaskets are used to seal the glazing, sash-frame junction and ensure condensation drainage. Physical-mechanical properties of gaskets meet DIN 7863 requirements. Operation life is at least 15 years. Fastening elements used to connect profiles and other components are made of aluminium and stainless steel. The system provides for the use of hardware from leading suppliers (Savio, Fapim, Giesse). Aluminium profiles are coated by protective-decorative polymeric layers (width: 60 micron at least) or anodic layer (width: 20 micron at least). The colour range includes any RAL-colour and 11 anodizing colours. It is quite popular to apply two different colours for exterior and interior part of combined profiles. The high quality of coating is confirmed by Qualicoat and Qualanod international certificates.